Wall Art There are 106 products. Play your own song of style with this 2-piece wall art set. Circle pattern puts a new spin on the guitar and headphones design. Yellow, blue and white color palette disperses glee throughout the room. Go a little wild with your choice of kids wall art. With its giraffe-themed renderings, this 2-piece wall art set brings home spot-on style they're sure to love. Flower power. Pairing brilliant color with a lovely motivational message, this 2-piece wall art set is an inspired touch in kids room decor. Bring a furr-ocious sense of style to a kid's room with this 2-piece wolf and bear wall art set. Gallery wrapped frameless canvas enhances the naturally cool aesthetic. Invigorate the imagination with vibrant color when you hang up this 2-piece wall art set. Teal, pink, yellow and orange are bursting with flower power in a fun paisley design. Made of quality gallery wrapped canvas, it's sure to bring loads of happiness and youthful style to your room. Over the moon for black and white photography? You're sure to find this wall art out of this world. Satellite view of the moon is nothing short of spectacular. 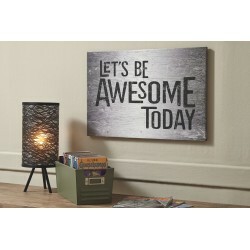 Send a motivational message in a cool, understated way with this black and white wall art. Distressed grainy backdrop infuses a raw, real sensibility. This eclectic wall art set showcases elephants and bohemian shapes draping over soft, dream-like hues. The exotic elements bring out your inner explorer, making it the perfect addition for travel-inspired decor. Easily create a cheerful bedroom with help from this wall art set. Cutesy graphic owls in shades of teal, pink, green and yellow delightfully perch on tree branches with matching flowers. This set of canvases look great alongside each other or hanged separately. Lions, tigers, and bears, oh my. Rest easy, there's no need to be afraid with this wall art. These friendly grizzlies would love to grace your home. Gallery wrapped canvas in black and tan is ready to hang. Take a retro bus trip with this wall art in gallery wrapped canvas. Three smooth riders in yellow, gray, blue, red, green and orange are ready to go to their next destination. Gain some flower power with this wall art. Playful flowers hang in pink, purple, yellow and blue on this gallery wrapped canvas. Wispy in light faded blues, this wall art set holds a sense of serenity for the avid dreamer. A faded herringbone print creates the illusion of being up in the clouds and inspirational quotes coddle your child's artistic heart. Hang up this pair of canvases side by side or spread the inspiration throughout the room. On a quest for style? You'll reach your design destination with this colorful wall art. The multicolored global map has a delightfully eclectic appeal that shows off your wanderlust. 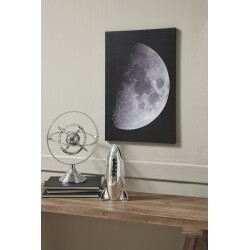 Blast off in style with this wall art set. Designed in charcoal and white, this set of canvases show us that minimalist design can truly be fun. It's a perfect bedroom addition for the imaginative child with sky-high dreams.